How do I determine whether or not two lines intersect, and if they do, at what x,y point? There’s a nice approach to this problem that uses vector cross products. Define the 2-dimensional vector cross product v × w to be vx wy − vy wx. Suppose the two line segments run from p to p + r and from q to q + s. Then any point on the first line is representable as p + t r (for a scalar parameter t) and any point on the second line as q + u s (for a scalar parameter u). 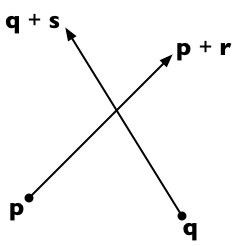 If r × s = 0 and (q − p) × r = 0, then the two lines are collinear. If the interval between t0 and t1 intersects the interval [0, 1] then the line segments are collinear and overlapping; otherwise they are collinear and disjoint. Note that if s and r point in opposite directions, then s · r < 0 and so the interval to be checked is [t1, t0] rather than [t0, t1]. If r × s = 0 and (q − p) × r ≠ 0, then the two lines are parallel and non-intersecting. 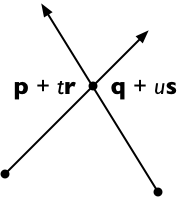 If r × s ≠ 0 and 0 ≤ t ≤ 1 and 0 ≤ u ≤ 1, the two line segments meet at the point p + t r = q + u s.
Otherwise, the two line segments are not parallel but do not intersect. Credit: this method is the 2-dimensional specialization of the 3D line intersection algorithm from the article "Intersection of two lines in three-space" by Ronald Goldman, published in Graphics Gems, page 304. In three dimensions, the usual case is that the lines are skew (neither parallel nor intersecting) in which case the method gives the points of closest approach of the two lines. FWIW, the following function (in C) both detects line intersections and determines the intersection point. It is based on an algorithm in Andre LeMothe's "Tricks of the Windows Game Programming Gurus". It's not dissimilar to some of the algorithm's in other answers (e.g. Gareth's). LeMothe then uses Cramer's Rule (don't ask me) to solve the equations themselves. I can attest that it works in my feeble asteroids clone, and seems to deal correctly with the edge cases described in other answers by Elemental, Dan and Wodzu. It's also probably faster than the code posted by KingNestor because it's all multiplication and division, no square roots! I guess there's some potential for divide by zero in there, though it hasn't been an issue in my case. Easy enough to modify to avoid the crash anyway. // intersect the intersection point may be stored in the floats i_x and i_y. The problem reduces to this question: Do two lines from A to B and from C to D intersect? Then you can ask it four times (between the line and each of the four sides of the rectangle). Here's the vector math for doing it. I'm assuming the line from A to B is the line in question and the line from C to D is one of the rectangle lines. My notation is that Ax is the "x-coordinate of A" and Cy is the "y-coordinate of C." And "*" means dot-product, so e.g. A*B = Ax*Bx + Ay*By. This h number is the key. If h is between 0 and 1, the lines intersect, otherwise they don't. If F*P is zero, of course you cannot make the calculation, but in this case the lines are parallel and therefore only intersect in the obvious cases. The exact point of intersection is C + F*h.
If h is exactly 0 or 1 the lines touch at an end-point. You can consider this an "intersection" or not as you see fit. Specifically, h is how much you have to multiply the length of the line in order to exactly touch the other line. 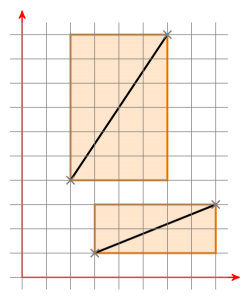 Therefore, If h<0, it means the rectangle line is "behind" the given line (with "direction" being "from A to B"), and if h>1 the rectangle line is "in front" of the given line. A and C are vectors that point to the start of the line; E and F are the vectors from the ends of A and C that form the line. Why? Because two non-parallel lines must intersect, which means you can scale both lines by some amount each and touch each other. We have to eliminate one of these variables. An easy way is to make the E term zero. To do that, take the dot-product of both sides of the equation using a vector that will dot to zero with E. That vector I called P above, and I did the obvious transformation of E.
I have tried to implement the algorithm so elegantly described by Jason above; unfortunately while working though the mathematics in the debugging I found many cases for which it doesn't work. For example consider the points A(10,10) B(20,20) C(10,1) D(1,10) gives h=.5 and yet it is clear by examination that these segments are no-where near each other. Here's an improvement to Gavin's answer. marcp's solution is similar also, but neither postpone the division. Basically it postpones the division until the last moment, and moves most of the tests until before certain calculations are done, thereby adding early-outs. Finally, it also avoids the division by zero case which occurs when the lines are parallel. You also might want to consider using an epsilon test rather than comparison against zero. Lines that are extremely close to parallel can produce results that are slightly off. This is not a bug, it is a limitation with floating point math. Question C: How do you detect whether or not two line segments intersect? I have searched for the same topic, and I wasn't happy with the answers. So I have written an article that explains very detailed how to check if two line segments intersect with a lot of images. There is complete (and tested) Java-code. If both bounding boxes have an intersection, you move line segment a so that one point is at (0|0). Now you have a line through the origin defined by a. Now move line segment b the same way and check if the new points of line segment b are on different sides of line a. If this is the case, check it the other way around. If this is also the case, the line segments intersect. If not, they don't intersect. Question A: Where do two line segments intersect? You know that two line segments a and b intersect. If you don't know that, check it with the tools I gave you in "Question C". Now you can go through some cases and get the solution with 7th grade math (see code and interactive example). Question B: How do you detect whether or not two lines intersect? Let's say your point A = (x1, y1), point B = (x2, y2), C = (x_3, y_3), D = (x_4, y_4). Your first line is defined by AB (with A != B), and your second one by CD (with C != D). Question D: Where do two lines intersect? Check with Question B if they intersect at all. The lines a and b are defined by two points for each line. You can basically apply the same logic was used in Question A. The answer once accepted here is incorrect (it has since been unaccepted, so hooray!). It does not correctly eliminate all non-intersections. Trivially it may appear to work but it can fail, especially in the case that 0 and 1 are considered valid for h.
These are perpendicular lines which clearly do not overlap. So, apparently the two line segments meet at (0,0), which is on line CD, but not on line AB. So what is going wrong? The answer is that the values of 0 and 1 are not valid and only sometimes HAPPEN to correctly predict endpoint intersection. When the extension of one line (but not the other) would meet the line segment, the algorithm predicts an intersection of line segments, but this is not correct. I imagine that by testing starting with AB vs CD and then also testing with CD vs AB, this problem would be eliminated. Only if both fall between 0 and 1 inclusively can they be said to intersect. I recommend using the vector cross product method if you must predict end-points. Finding the correct intersection of two line segments is a non-trivial task with lots of edge cases. Here's a well documented, working and tested solution in Java. NOTE: In the code, I assume that a line segment (x1, y1), (x2, y2) with x1 = x2 and y1 = y2 is a valid line segment. Mathematically speaking, a line segment consists of distinct points, but I am allowing segments to be points in this implementation for completeness. * This snippet finds the intersection of two line segments. * intersection is a subsegment there's an overlap. // Small epsilon used for double value comparison. // Returns  0 if all three points are collinear. // Returns -1 if 'c' is clockwise to segment (a, b), i.e right of line formed by the segment. // formed by the segment. // Tests whether point 'c' is on the line segment (a, b). // Determines whether two segments intersect. // segments, segments which are points (x1 = x2 and y1 = y2) are allowed. // Both segments are a single point. // One of the line segments is an intersecting single point. // because the solution might be a sub segment. // segments since they overlap each other. // The subsegment is part of segment #1 and part of segment #2. // Find the middle points which correspond to this segment. // There is actually only one middle point! // Segment #1 is a vertical line. // Segment #2 is a vertical line. Just wanted to mention that a good explanation and explicit solution can be found in the Numeric Recipes series. I've got the 3rd edition and the answer is on page 1117, section 21.4. Another solution with a different nomenclature can be found in a paper by Marina Gavrilova Reliable Line Section Intersection Testing. Her solution is, to my mind, a little simpler. Plenty of solutions are available above, but I think below solution is pretty simple and easy to understand. The endpoints a and b are on opposite sides of the segment CD. The endpoints c and d are on opposite side of the segment AB. More specifically a and b are on opposite side of segment CD if and only if exactly one of the two triples a,c,d and b,c,d is in counterclockwise order. Here CCW represent counterclockwise which returns true/false based on the orientation of the points. This is working well for me. Taken from here. // calculates intersection and checks for parallel lines. // calculate angle between the two lines. // on the line segment. I tried some of these answers, but they didnt work for me (sorry guys); after some more net searching I found this. With a little modification to his code I now have this function that will return the point of intersection or if no intersection is found it will return -1,-1. '//  with the line segment defined by points C and D.
'//  Returns YES if the intersection point was found, and stores that point in X,Y. '//  Fail if either line segment is zero-length. '//  Fail if the segments share an end-point. '//  (1) Translate the system so that point A is on the origin. '//  Discover the length of segment A-B. '//  (2) Rotate the system so that point B is on the positive X axis. '//  Fail if segment C-D doesn't cross line A-B. '//  (3) Discover the position of the intersection point along line A-B. '//  Fail if segment C-D crosses line A-B outside of segment A-B. '//  (4) Apply the discovered position to line A-B in the original coordinate system. I think there is a much much simpler solution for this problem. I came up with another idea today and it seems to work just fine (at least in 2D for now). All you have to do, is to calculate the intersection between two lines, then check if the calculated intersection point is within the boundig boxes of both line segments. If it is, the line segments intersect. That's it. This based on Gareth Ree's answer. It also returns the overlap of the line segments if they do. Coded in C++, V is a simple vector class. Where the cross product of two vectors in 2D returns a single scalar. It was tested and passed by my schools automatic testing system. //Math trick db cross db == 0, which is a single scalar in 2D. Here's a basic implementation of a line segment in C#, with corresponding intersection detection code. It requires a 2D vector/point struct called Vector2f, though you can replace this with any other type that has X/Y properties. You could also replace float with double if that suits your needs better. This code is used in my .NET physics library, Boing. /// Attempt to intersect two line segments. /// Even if the line segments do not intersect, <paramref name="t"/> and <paramref name="u"/> will be set. /// If the lines are parallel, <paramref name="t"/> and <paramref name="u"/> are set to <see cref="float.NaN"/>. # If r x s = 0 and (q - p) x r = 0, then the two lines are collinear. # then the two lines are collinear but disjoint. # No need to implement this expression, as it follows from the expression above. # Otherwise, the two line segments are not parallel but do not intersect. If each side of the rectangle is a line segment, and the user drawn portion is a line segment, then you need to just check the user drawn segment for intersection with the four side line segments. This should be a fairly simple exercise given the start and end points of each segment. I read these algorithm from the book "multiple view geometry"
assume x is a point, a vector, and x = L1 x L2 (L1 cross product L2). be careful, x is always a 2D point, please read homogeneous coordinates if you are confused about (L1xL2) is a three elements vector, and x is a 2D coordinates. we substitute (L1xL2) with vector x, then we have L1*x=0, L2*x=0, which means x lie on both L1 and L2, x is the intersection point. be careful, here x is homogeneous coordinates, if the last element of x is zero, it means L1 and L2 are parallel. Not the answer you're looking for? Browse other questions tagged geometry line-intersection or ask your own question. Determining if two line segments intersect? How to calculate the intersection of two lines? How to determine based on pairs of coordinates if there is an intersection between the two?